Nepenthes maxima X sanguinea is hybrid between two highlanders. Both parent species are very vigorous growers and this hybrid is no exception. 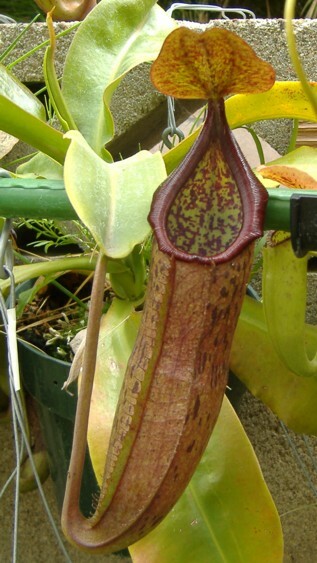 It has produced a pitcher on every leaf and continues to get bigger and bigger. The latest photo is showing more darkening as the pitcher opens up. Earlier pitchers were more striped, but now they are darker. I'm not sure if this hybrid originated from Exotica Plants or not. I purchased the plant from Tristan's but many of their hybrids originated from Exotica so this plant could as well. This plant will get large and be one of those Nepenthes that does great with very little attention to it. I got it mainly because I like hybrids that have N. sanguinea in them. As far as I know this is not a rare hybrid but I haven't seen it around very much and that may be because it isn't one of the spectacular hybrids floating around or in high demand. Because this hybrid should be extremely hardy and vigorous, this would make an excellent starter plant to experiment with outdoors.